Virtualization introduces new challenges for managing your data center. Applications now compete for shared resources such as storage, CPU cycles and memory, often causing performance bottlenecks and unhappy customers. 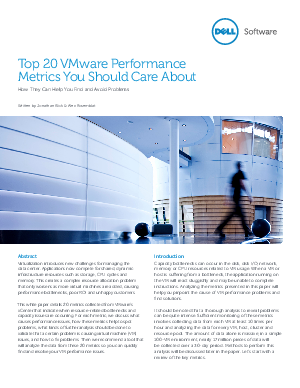 This paper details 20 metrics that indicate when capacity issues are occurring and recommends a corresponding tool that will analyze the data and resolve your VM performance issues.